I think we all know what exactly a spillway opening is but for those who don’t it is when the Bonnet Carre Spillway is opened to relieve pressure off the Mississippi River allowing it to flow freely into Lake Pontchartrain. There seems to be many of questions asking how the spillway will effect the lake every time it is opened. What a lot of people are forgetting is that it almost opens every year here lately. If you look back at the charts it has only been opened 15 or so times in its history dating back to the early 1900’s. But 10 or so of those times have been in the last 20 years and opened 3 out of the last 4. What used to seem rare is now part of the norm. Does it slow the trout fishing down? Sure it does. Does the water get fresh and dirty? Absolutely, in most areas. Can you still catch speckled trout around Lake Pontchartrain during an opening? ABSOLUTELY!!!! One way to show this is by the pictures you see in this story. These pictures are from an epic day with Capt. Kris Robert on March 28th, 2019. The reason I know the exact date is because we made a Dockside TV episode on that very day purposely to show how good the trout were biting and the spillway had been open for 3 weeks. Make sure to watch this episode when it airs, it will be called “Slamming Spillway Specks”. It’s just a matter of finding pockets of green water. They are much harder to find but when you do find them they consolidate the trout. Although we caught fish most of March and we should still be able to catch some trout through April it has been a tough spring so far and I don’t see it being anywhere close to a banner trout year, but it’s still spring time trout fishing so the trout that are around are gorging themselves before they begin their spawn. What will happen as we go deeper into spring and toward summer is that speckled trout will go into full force spawning mode seeking much saltier water than Pontchartrain can offer right now. 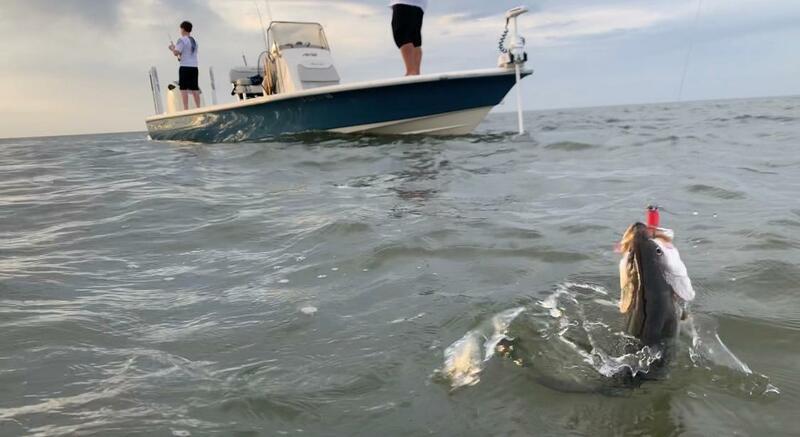 A lot of smaller and juvenile fish will hang around but the big girls will be pushed out toward the Mississippi Sound looking for high salinity. When that happens you can do one of two things. Chase redfish deep in the marsh and stay close to home like I do or make long boat rides and chase trout down if you are a speckled trout enthusiast. Look for a strong fall this year with all the nutrients that were dumped into the lake from the mighty Mississippi as trout do not need the salty water in the fall and winter. They will push back in to the Pontchartrain basin and will be in our back yards before we know it.